Scenario (3): Developed Product; Existence of Security Tokens Security tokens are an obvious answer to the “zombie network” phenomena. In this article, security tokens are defined as tokens that have equity-like characteristics. For example, if HouseChain issues 100 HouseSTs, and a person owns 10 of those, then he or she owns 10% of HouseChain and has 10% of the shareholder votes. By insisting HouseChain raises capital through a security token issuance, cryptoinvestors are separating raising capital and the speculation associated with it from the product HouseChain is selling. On the capitalization side, a HouseChain issues a certain amount of HouseSTs that it then distributes to founders, developers, etc. and sells some to early accredited investors. After the lock-up period is over and HouseSTs are listed on an exchange, initial security token holders would be able to sell their HouseSTs. This provides a liquidity event for initial HouseST holders and expands the investor base. In this scenario, utility tokens are purchased directly from the company, and exchanges become market makers for HouseST. On the utility token side, HouseChain interacts directly with its customers and decides whether to burn, hold, or re-sell utility tokens based on the demand/supply curve of its specific product. HouseCoins become what they were meant to be all along: a means to book short-term rentals in a decentralized marketplace. In this scenario, those in charge of HouseChain now have an incentive to create a valuable network, as a greater number of HouseChain constituents will benefit from a valuable network. 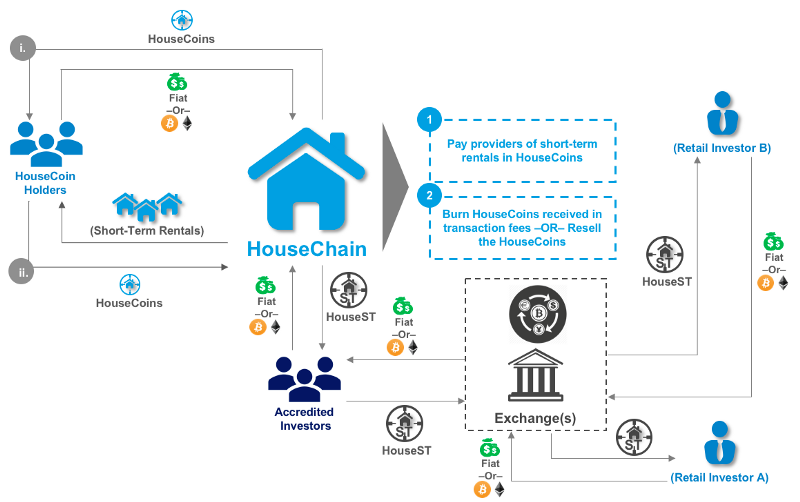 Selling more HouseCoins for users to book short-term rentals will increase the number of users in the network, increasing the number of transactions in the network, which will increase total network value and drive stronger cashflow generation, which in turn will increase the value of the security token. Founders, developers, and other members of the HouseChain team would have been paid in HouseSTs so now their incentive is to increase the value of the network, and thus their personal wealth. This set-up forces founders to think of the long-term prospects of the HouseChain network instead of focusing on short-term price appreciation. Because of the dynamics that play out when you separate speculation from utility tokens, I can see a world where issuing security tokens becomes the standard for raising capital, and utility tokens become nothing more than inventory that a company has either pre-sold or will continue to unload just like “traditional” companies have been doing. Disclaimer. This post is intended for informational purposes only. The views expressed in this post are not, and should not be construed as, investment advice or recommendations. This document is not an offer, nor the solicitation of an offer, to buy or sell any of the assets mentioned herein. All opinions in this post are my own and do not represent, in any manner, the views of Decipher Capital Partners or affiliated companies.